Saw this one and Adjustment Bureau back to back. Although the latter has an incredulously plot, at least some humour got me interested. As for this one, can this be a bit tedious? 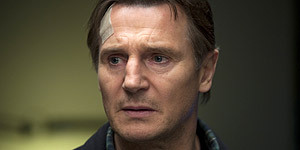 We get it that Liam Neeson did well in "Taken" but do we need to see the same role again, but this time in Berlin? There were more holes in the story than Madonna's pants, I hope you enjoy coincidences because they really, really insult your intelligence. Oh, do remember to bring along the Hollywood checklist ie car chase, checked, German who aren't very kind, checked, twist in the tale but was done out of effect, checked. The only words to describe this mystifying supernatural thriller are dull, overblown and soppy. We can never get to grips with it and once again, although Liam Neeson adds some sheer toughness, this is just another idiotic bone-cruncher that suffers from an incredible lack of suspense like Neeson's previous actioner Taken. Fairly entertaining action film that keeps the action going. My problem with the film was that it was SO predictable. It has a twist, but its been done before and it was so obvious that this film was going to be using the same plot line. The film had the obligatory set pieces .... car chase through the city, vulnerable but plucky female supporting character, ruthless emotionless villain, big explosion etc, and because they are all so cliche its hard to empathise with the characters. As each character was introduced it was pretty obvious who was going to survive and who was going to get killed, who were the villains, how each situation was going to be resolved etc.